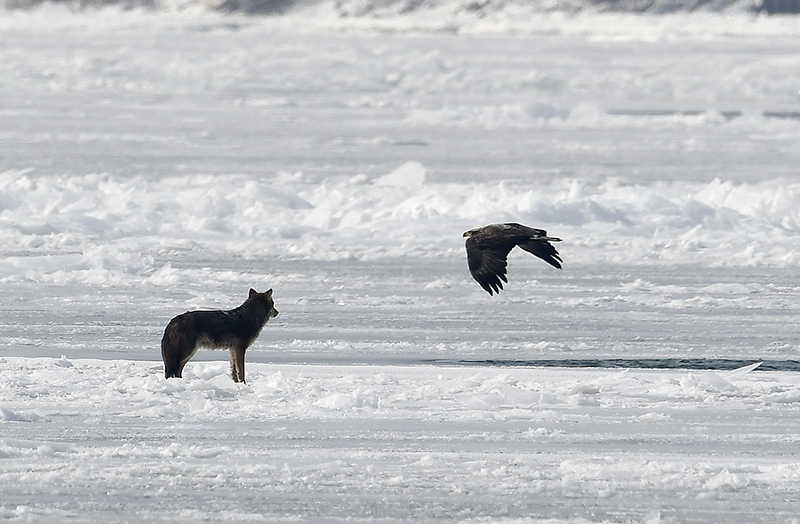 Nature was on full display when a coyote and three bald eagles squared off over a carcass frozen in the ice of the St. Clair River at Corunna on Feb. 2. “I’ve never seen anything like it,” said local nature photographer Ronny D’Haene, who was standing on the shore near the Shell Canada refinery when he noticed the commotion. Three eagles, including the immature bird seen here, were feasting on the frozen carcass when the coyote moved in to steal it. “He succeeded to snack on it for a minute while being dive-bombed by the eagles, taking turns,” he said. In the end, the birds won out and the coyote, reluctantly, headed south on the ice toward Stag Island.